Contagion, Mankind Beyond Earth, and Raw Data Is an Oxymoron, reviewed. 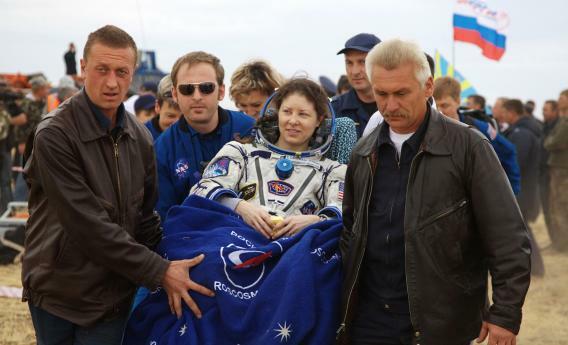 NASA astronaut Tracy Caldwell Dyson is carried after the Soyuz TMA-18 spacecraft she was in landed in Kazakhstan on Sept. 25, 2010. The nutshell: The space shuttle fleet has been retired—but where are we off to next, how do we get there, and why should we want to go to space? Piantadosi explores the science, innovation, politics, and finances of the past and future of human space travel. Literary lovechild of: Tom Wolfe’s The Right Stuff and Neil deGrasse Tyson’s Space Chronicles: Facing the Ultimate Frontier. You’ll find it on your bookshelf if: Your first dog was named Laika. And you tried to launch her into space. Cocktail party fodder: Astronauts in space have 1-1.5 percent bone loss in their pelvis and lower spine each month—and an astronaut on a long-term mission loses 30-50 percent of his or her muscle mass. For optimal benefit: Bring it along to pass the time on the Discovery One mission to Jupiter, unless you’re a crewmember in cryogenic hibernation. Snap judgment: Non-space nuts may feel slightly overwhelmed by the scientific minutiae Piantadosi delves into, but almost anyone will dig facts like the projected amount of waste a six-person crew will generate on a mission to Mars (23 pounds per day) and the per-astronaut dollars NASA spent putting men on the moon ($3 billion apiece in 1972 dollars). The nutshell: Essays by historians, literary critics, and media and information scholars examine what we talk about when we talk about data—from the roots of the word itself to the innovators who changed how we collect it, including such disparate characters as mathematicians and abolitionists. Data collection, argues the collection’s editor, New York University media historian Gitelman, is often the same thing as data manipulation. Literary lovechild of: Nate Silver’s The Signal and the Noise: Why So Many Predictions Fail—but Some Don’t and Paul Starr’s The Creation of the Media: Political Origins of Modern Communication. You’ll find it on your bookshelf if: You invented your first decimal filing system when you were 4. Cocktail party fodder: One-fifth of scientific researchers report generating data sets of 100 gigabytes or more; four-fifths of scientific researchers say they have insufficient funds for data curation. For optimal benefit: Store this book wisely. The nutshell: University of Oxford medical historian Harrison explores the link between illness and trade in an economic and medical history of the past six centuries, moving from the Black Death (which, he argues, most likely had its roots in China) to SARS and H1N1. Literary lovechild of: Richard Preston’s The Hot Zone: A Terrifying True Story and Thomas Friedman’s The World Is Flat: A Brief History of the Twenty-First Century. You’ll find it on your bookshelf if: You totally get those people who wear medical face masks on the subway—in fact, you don’t quite get anyone who doesn’t wear a face mask on the subway. Cocktail party fodder: Bovine spongiform encephalopathy—mad cow disease—was likely transmitted across international borders not by the trade of meat or cattle but by the trade of feed. For optimal benefit: Combine this with a movie marathon that includes Outbreak, Contagion, And the Band Played On, and The Andromeda Strain. Exercise caution if sharing popcorn. Snap judgment: Harrison’s history is full of scary stuff—terrifyingly well-documented. The diseases are just as cautionary as the government responses to them, and we would all do well to take heed. December: Saving Babies, Near-Earth Objects, and Learning To Change the World. November: Netflixed, Discord, and Million Death Quake.